I hope you had a beautiful week, and I hope you like art. Because that is what this post is all about! Now some of you might remember that I talked about architecture >here< ages ago. I am very interested in architecture and art, and I noticed when I looked back onto my posts this year, that I barely write about it. The main reason was, that I wasn’t really confident enough to just choose a piece of art to then talk about it. Why? Because I thought that my opinion wasn’t educated enough to really count, but to be honest, opinions about artwork has always been controversial, so I decided I might just give it a go and see how many of you are little art fans as well! The painting I want to show you today is from Anselm Kiefer, a German painter, born in March 8th, 1945. His subjects are mostly inspired by Norse mythology, German history (especially the Holocaust) and often times incorporates parts of poems and other writing in his artwork. He paints in metaphors and symbols, works with materials like glass, dried flowers and hay to create a three-dimensional effect on his typically huge canvasses. I remember seeing some of his artwork in an exhibition, actually it was even in the Guggenheim Museum Bilbao, and I thought that most of it was very gloomy looking, sad and so destructed. But this particular piece stood out for me for multiple reasons. First of all, I love looking at the night sky. 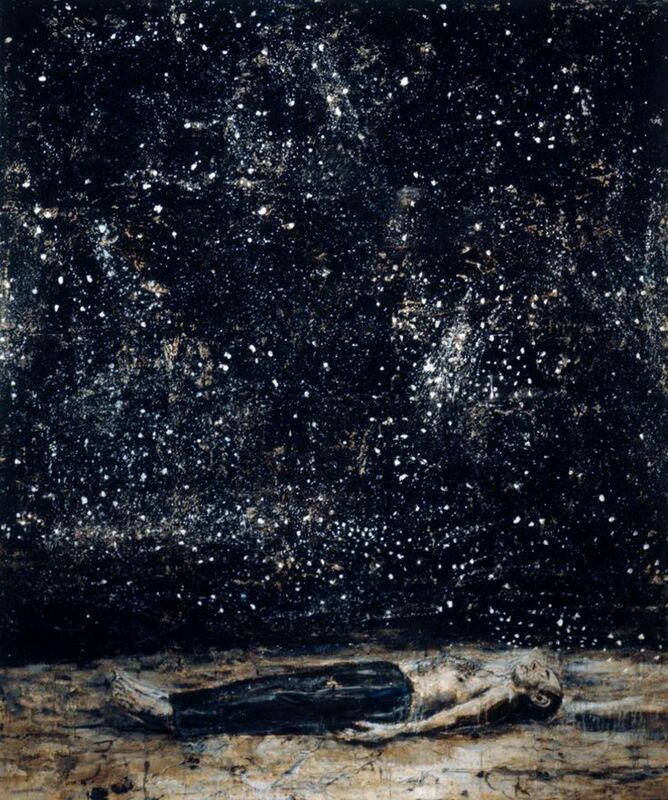 Stars are something incredibly fascinating to me and I think Kiefer captured a beautiful night sky in this painting. That really got my attention. Some art needs to be gloomy looking and dark to create the effect the painter wanted. But I personally am usually more affected by the pieces that give you a reason to hope. And that was the case with this painting. It is very poetic. Not a happy painting, mystique and thoughtful. It has a melancholy in it that can’t be denied. But somehow the sparkling sky makes up for it. If Kiefer himself told me that he dreamt this painting, I would believe him instantly. I think that is what I like so much about it. I like that it makes me feel like I am in a dream looking up into the sky full of stars with a melancholic but also hopeful note. This painting is certainly not one of Anselm Kiefer’s best-known work. Researching for this article I saw a whole other range of his work (click here to see more artwork) that was just as impressing and thought-provoking. But I saw this painting with my own eyes, walked through a whole museum of artwork (and if you check my post architecture post about it, you will see that it’s quite a big museum) and this piece is one that stuck with me since then. That is my honest opinion, as I said I am no art student or professor (yet 😉 ), but I think that shouldn’t stop any of us to say out loud our thoughts about art. So, I ask you guys, every one of you, to now tell me your thoughts and feelings about this artwork! Art is longing. You never arrive but you keep going in the hope that you will. Exactly! That’s what i think too! I think this topic is great! I love the moody vibe. Makes it very cool and more to discuss! Thank you! I’m glad you agree and enjoyed it! Thank you so much for these kind words, gracie! I am happy to hear so! Love the topic! I can see why this painting stood out for you, it’s really dreamy & captivating! Thanks for sharing! Exactly! Thanks so much for your thoughts, Claudia! What a great post! I love the painting and your wonderful words about it. Aw you’re so sweet Pamela! It’s 7 am and you already made my day! Isn’t it just beautiful? I love that art can be so breathtaking but also thought-provoking! Thanks for stopping by!! Omg, thank you so so much Syvilla! Comments like yours never fail to make my day and keep me going at 110 %! You’re so sweet, thank you! Great topic and I love the vibe of it! Thanks!! I’m glad to hear that! I just randomly somehow came across your blog, and I’m so glad:) I went through your blog posts, not all of them yet, but enough to end up commenting about ho i simply loved your blog. You’re so genuine out here and speaking your heart and mind. Love it! Aw thank you so much, that’s such a huge compliment, you just totally made my day!